Various invertebrate species maintain chemosynthetic ecosystems around deep-sea hydrothermal vents. For vent-endemic benthos, larval recruitment is presumably critical for population maintenance and colonization via dispersal among hydrothermal vent sites. The lepetodrilid limpet, Lepetodrilus nux, is a hydrothermal vent-endemic species and one of the most abundant gastropods at hydrothermal vents in the Okinawa Trough, in the northwestern Pacific Ocean. However, detailed assessment of genetic diversity and connectivity based on individual genetic profiles has not been possible previously. We examined these parameters in L. nux at five hydrothermal vent sites (maximum geographic distance: ~550 km, depth range: ~700 m to ~1,650 m) using population genetic analysis of 14 polymorphic microsatellite loci. Genetic diversity based on allelic richness and expected heterozygosity has been maintained at hydrothermal vent sites investigated. Meanwhile, low genetic differentiation among populations was detected and pairwise FST values ranged from –0.003 to 0.023 and G”ST values ranged from –0.016 to 0.098. Genetic clustering relatively reflected the geographic distance among sites. There was a relationship between genetic differentiation and geographic distance (P = 0.010 in FST, P = 0.017 in G”ST), but there was no relationship with depth (P = 0.350 in FST, P = 0.336 in G”ST). Relative migration rates also showed a tendency toward isolation-by-distance, but migration direction was not necessary unidirectional. Larvae of L. nux apparently ascend via the thermal plume to wander in the water column, utilizing currents closer to the surface for stochastic long-distance dispersal. This behavior suggests that stochastic stepping-stone dispersal contributes significantly to population connectivity and maintenance of this species in the Okinawa Trough. Figure 1: Genetic diversity has been maintained each vent site and genetic differentiation is low between most populations (FST = –0.003–0.023, G”ST = –0.016–0.098), but significant between distant vents in Lepetodrilus nux. Genetic structure was confirmed among vent sites, and different clusters were identified by DAPC. Each population is maintained by “stepping-stone” connectivity within the Okinawa Trough, regardless of the depth. Details about microsatellite markers are provided in Nakajima et al. (2017). 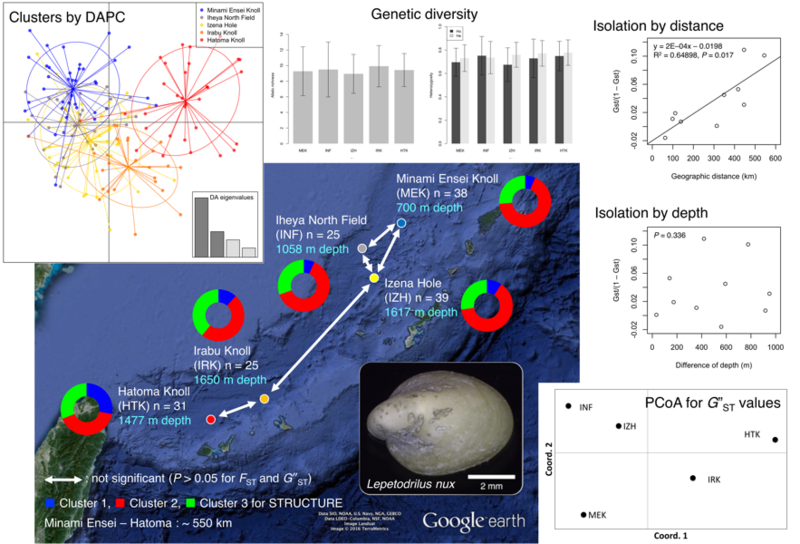 Nakajima, Y., Shinzato, C., Khalturina, M., Nakamura, M., Watanabe, H. K., Nakagawa, S., Satoh, N., Mitarai, S. Isolation and characterization of novel polymorphic microsatellite loci for the deep-sea hydrothermal vent limpet, Lepetodrilus nux, and the vent-associated squat lobster. Marine Biodiversity, Shinkaia crosnieri, doi: doi.org/10.1007/s12526-017-0704-5 (2017). Kamidaira, Y., Uchiyama, Y., Mitarai, S. Eddy-induced transport of the Kuroshio warm water around the Ryukyu Islands in the East China Sea. Continental Shelf Research, doi: doi.org/10.1016/j.csr.2016.07.004 (2017). Nakajima, Y., Wepfer, P. H., Suzuki, S., Zayasu, Y., Shinzato, C., Satoh, N., Mitarai, S. Microsatellite markers for multiple Pocillopora genetic lineages offer new insights about coral populations. Scientific Reports, doi: doi.org/10.1038/s41598-017-06776-x (2017). Sato, K. N., Powell, J., Rudie, D., Levin, L. A. Evaluating the promise and pitfalls of a potential climate change–tolerant sea urchin fishery in southern California. ICES Journal of Marine Science, doi: doi.org/10.1093/icesjms/fsx225 (2017). Mullineaux, L. S., Metaxas, A., Beaulieu, S. E., Bright, M., Gollner, S., Grupe, B. M., Herrera, S., Kellner, J. B., Levin, L. A., Mitarai, S., Neubert, M. G., Thurnherr, A. M., Tunnicliffe, V., Watanabe, H. K., Won, Y. Exploring the Ecology of Deep-Sea Hydrothermal Vents in a Metacommunity Framework, Frontiers in Marine Science. doi: doi.org/10.3389/fmars.2018.00049 (2018). 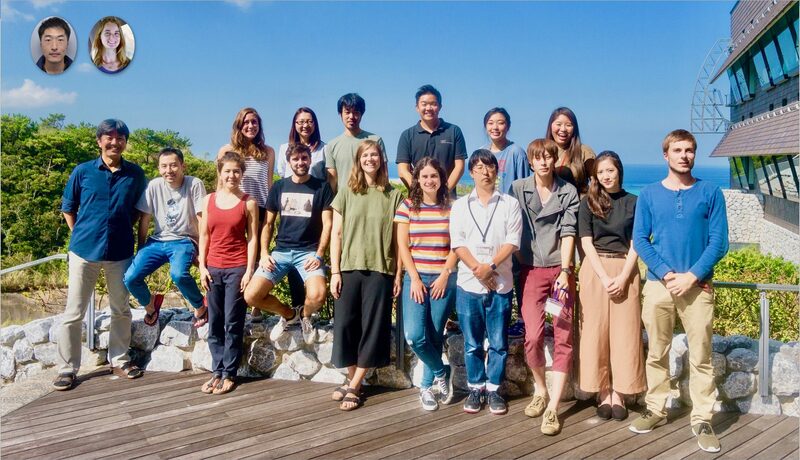 ([NOTE] *Seminars and workshops by OIST faculty/unit members (either with or without other speakers), either at OIST or at other institutions than OIST, should be included in the 4.3 Oral and Poster Presentations. Mitarai, S.Quantifying Dispersal from Hydrothermal Vent Fields in the Western Pacific Ocean, 6th International Symposium on Chemosynthesis-Based Ecosystems (CBE6), Woods Hole, Mass, USA, 2017.09.01 (2017). Nakajima, Y., Nakamura, M., Watanabe, H., Mitarai, S. Stepping-stone larval dispersal contributes to genetic diversity and connectivity among populations of a hydrothermal vent limpet in the Okinawa Trough, 6th International Symposium on Chemosynthesis-Based Ecosystems (CBE6), Woods Hole, Mass, USA, 2017.08.27-09.01 (2017). Shirayama, Y., Mitarai, S., Kawauchi, M., Xiaobo, L., Kankee, T., Yamamoto, H. Marine environmental assessment and management, Annual meeting of the Research and Development Center for Submarine Resources, Tokyo, Japan, 2017.09.08 (2017). Le Gal. M., Violeau, D., Ata, R. Simulation of the Tohoku-Oki tsunami with Telemac, the French-Japanese Week on Disaster Risk Reduction, Tokyo, Japan, 2017.10.04 (2017). Brisbin, M. M., Grossmann, M. M., Mitarai, S. Friend or Foe: A Multiple Meta Omics Investigation into the Nature of the Acantharea-Phaeocystis Symbiosis, 2018 Ocean Sciences Meeting, Portland, Oregon, USA, 2018.02.15 (2018). Thomas, M. K., Nakajima, Y., Mitarai, S. Intra- and Inter-Island Propagule Transport of Mangrove Species in Northern West Pacific, 2018 Ocean Sciences Meeting, Portland, Oregon, USA, 2018.02.13 (2018). Mitarai, S., McWilliams, J. C., Grossmann, M. M., Gallager, S. Wave Glider Observations of Surface Winds and Currents in the Core of Typhoon Danas, 2018 Ocean Sciences Meeting, Portland, Oregon, USA, 2018.02.14 (2018). Wepfer P.H., Nakajima Y., Economo E.P., Mikheyev A., Mitarai S. Dispersal Patterns of the Coral Galaxea fascicularis across the Northwestern Pacific Ocean, 2018 Ocean Sciences Meeting, Portland, Oregon, USA, 2018.02.11-02.16 (2018). Sato, K. N., LA Levin. Climate Change and ENSO Impacts on Southern California Sea Urchins: Informing Fisheries Management Adaptation Plans, 2018 Ocean Sciences Meeting, Portland, Oregon, USA, 2018.02.15 (2018).